April 9th is the opening of MODEX 2018 in Atlanta, Georgia. While Topper Industrial is well-known and well-respected as the manufacturer of the best industrial carts throughout North America, the company is also known as the leader in the Fork Truck Free movement. The chart above reveals the rationale that the material handling industry is going fork truck free. Just two months after MODEX 2018, National Safety Month will take place. Each year the safety professionals in both manufacturing and materials handling focus on reducing leading causes of injury and death at work. Throughout the year, Topper Industrial joins thousands of organizations and businesses in raising awareness in preventing injuries and deaths the workplace. The safety decision is the obvious rationale and benefit for Fork Truck Free. Safety is a sound and solid business decision. OSHA’s Office of Regulatory Affairs suggested that $4-6 is saved for every $1 invested in safety equipment and programs. The single riskiest equipment on the manufacturing plant floor or distribution center is the forklift. Only in a fork truck free environment can the severity and probability of worker injury be dramatically mitigated. Only Topper Industrial carts with more than 100 patents are ergonomically desirable, cost-effective, and proven safer and more profitable. During MODEX 2018 the Topper educational seminar (http://bit.ly/2ib2n1V) will demonstrate how implementing a Fork Truck Free environment for material flow and movement will protect the workplace from employee injuries and deaths, boost lean efficiency, and experience dramatic cost reductions. Often what triggers better safety practices is a serious employee injury or worse yet, an employee death. There are severe cost burdens associated with forklift accidents and OSHA citations. With the unemployment rate at the lowest level since 1969, the scarce labor availability, and higher labor wages, exposes safety concerns. Ultimately safety concerns lead to lean alternatives for manned forklift transport and continuous process improvement strategies. Flexible automation is quickly leading Fork Truck Free adoption among manufacturing companies throughout North America. 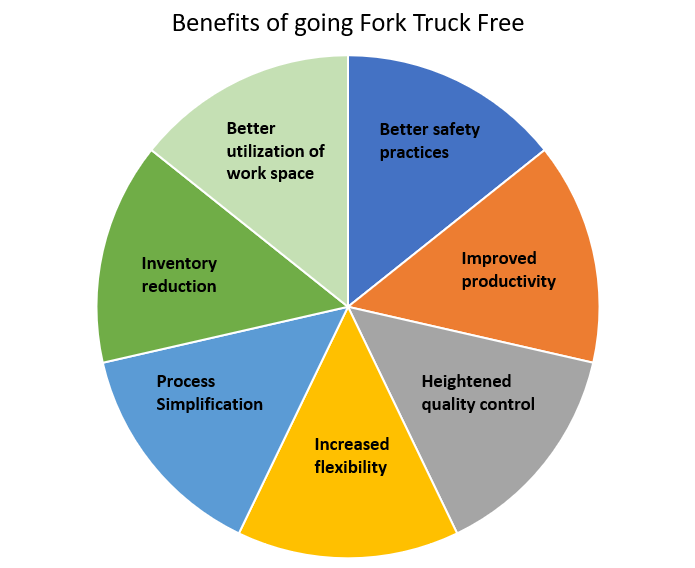 Even at the lean microcosm, the simple task of moving product within a manufacturing cell rather than calling, waiting, and using a fork truck is driving huge adoption of new fork truck free technologies. A manufacturing cell can reduce part transportation because the proximity of the cell’s resources makes part transportation almost non-existent. As a result, material handling equipment can be reduced or eliminated completed. Previous post Topper Industrial shows off safety features in new video highlighting their patented pending Walk Through Mother Daughter cart system.